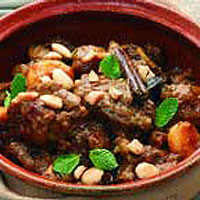 One glorious aspect of Moroccan cuisine is the tradition of blending fruit and nuts with meat. When cooked slowly together, the meat becomes meltingly tender, the fruit dissolves into the juices, and the nuts give texture. This recipe, from the Momo Cookbook (Simon & Schuster; £14.99), is a perfect example. Heat a frying pan, without oil, over a very low heat and toast the saffron strands, stirring with a wooden spoon, for 2-3 minutes. While still warm, put them in a pestle and mortar and crush to a fine powder (or use a small bowl and crush with a wooden spoon). Put the crushed saffron in a large, flameproof casserole or tagine. Add the ground cinnamon and turmeric, the salt and white pepper and mix well. Cut the lamb into pieces weighing about 100g each, and roll them in the spice mix, ensuring all the pieces are thoroughly coated. Add the oil to the casserole and place over a medium heat. Cook, turning, for about 5 minutes, to brown the lamb. Add the onions and garlic and cook for a further 5 minutes. Add the water, cover and leave to simmer gently for 1 hour. Meanwhile, place the dried apricots, prunes, figs and cinnamon sticks in a large bowl. After the meat has cooked for 30 minutes, take a ladleful of the stock from the casserole and tip over the dried fruit. Leave to swell for 30 minutes. When the meat has cooked for an hour, add the fruit mixture and juice to the casserole, cover and leave to cook for 10 more minutes. Remove the dish from the heat, top with the almonds and mint and serve straight away, with couscous. If you love to cook but are short of time, Bighams has a wonderful selection of ready-to-cook dishes, including their version of Moroccan Lamb (£4.99/480g). It includes hunks of lamb marinated in spices, fresh herbs, dried apricots and slivered almonds. Warm a frying pan, sauté and it's done in just 10 minutes.